The day started out cool, but warmed up nicely. Today was probably the best weather we had thus far. Mostly sunny, some clouds, and cool but not cold temps. I left on my cold weather riding gear, mostly because I thought we'd be getting into colder territory, but it wasn't so. 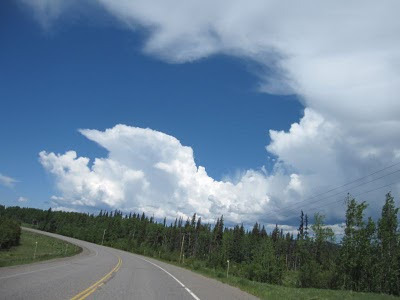 We took Highway 16 east from Prince George, BC and found vast amounts of territory filled with trees, lakes, rivers, and snow capped mountains. It's like what the United States might have looked like 200 years ago. Much of the riding today was somewhat monotonous. The scenery was beautiful, but after seeing the trees, the mountains, the lakes, it's all the same. It's like that for hundreds of miles. And the roads are not very twisty, mostly straight, with some wide sweepers. 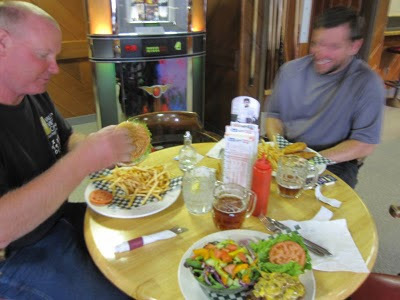 We stopped for lunch in Houston, BC at a pub called "Happy Jack Pub". With a name like that, how could you not stop for lunch? I had the Happy Jack Burger, which has everything on it plus mushrooms, and a pint of their house "Honey Brown Ale". 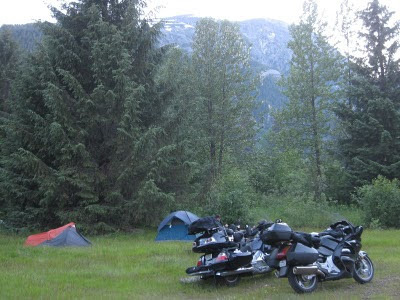 We did a lot of riding today, trying to get out to Hyder, AK. We figured if we could get to here, it would set us up for a full day of watching and photographing bears. And we made it here to Hyder too, and that's where I'm now typing this out. Hyder is unreachable from anywhere else but through Canada. 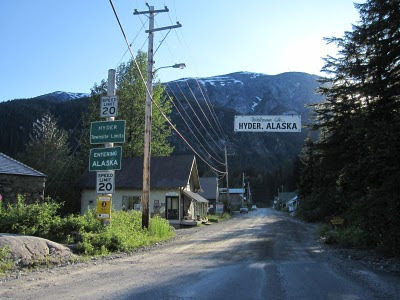 I'm not sure what Hyder, AK is all about. It's just a little town out in the wilds of Alaska. There are some locals here, but a lot of visitors. In fact, we met several other motorcycle riders here too. Interestingly, all the riders we've met out here are riding dual sports, BMW GS's, Kawasaki KLR's, and lots of Suzuki V-Stroms. Ever remember in grade school when you showed up to a special function where you were the only one wearing t-shirt and jeans, and everyone else was dressed up in their Sunday church clothes, and feeling out of place? Paul, the other guy in our group, decided to set up camp tonight at a lake somewhere along the Stewart Cassiar Highway. I hope he's doing fine. Where he camped was just swarming with mosquitoes, even more than the day before. Here in Hyder, the temperature is far cooler, and I think that's why we're not seeing any right now. Anyways, the campground here seems cool. Free firewood, pick out whatever camp spot you want. But don't leave any food in your bike. The camp host tells us that many other bikes have been wrecked from bears trying to get into the saddlebags. So I ate up all my snacks, which I didn't have much of. But I hope they don't want any of my berry-flavored Tums.